With its succinct, focussed and easy-to-follow approach covering both AS and A2, Revision Express is the fast and effective route to exam success. 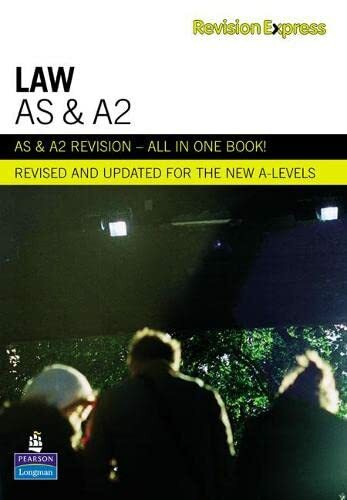 This new edition has been fully revised and updated for the new A-levels. If you're looking for a fast, focussed and effective way to revise for your AS or A2 exams, Revision Express is the answer. Now fully updated for the new A-levels, Revision Express covers everything you need for success in your exams. Each chapter is broken down into two-page topic sessions, packed with information, top tips and unique features to help you carefully organise your revision and gain vital extra marks. All the information is presented in short, memorable chunks for quick and simple revision and you can check your understanding and progress as you proceed with checkpoint questions. Develop and practice your exam techniques with sample exam-style questions (and answers -- luckily!) and get some inside information as A-level examiners reveal the secrets to getting top grades.